Americans are celebrating more holidays with more enthusiasm than ever before. 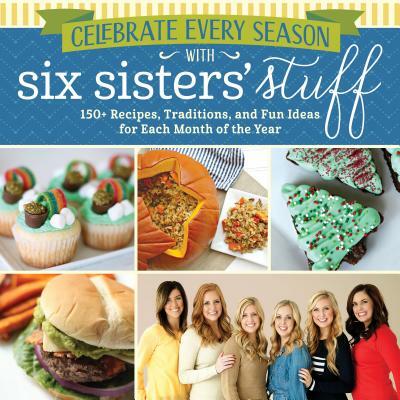 Who wouldn't want to extend the warm feelings of Christmas time all year round and popular bloggers and bestselling cookbook authors Six Sisters' Stuff are coming to the rescue with the ultimate go-to guide for celebrating every holiday plus ideas for creating new and memorable special occasions. This comprehensive cookbook includes recipes and ideas to celebrate all the popular holidays. Each month includes ten recipes as well as fun and fast ideas for parties and celebrations from hosting a "Noon New Year's Party for Kids" to a sampler selection of 12 different flavors of hot cocoa that are perfect for Christmas parties to "A Summer Bucket List of 50 Fun Things to Do," which includes making homemade ice cream, going camping, and visiting a museum. The book also features easy crafts like a monogrammed doormat and a DIY cookbook stand. The Six Sisters--Camille, Kristen, Elyse, Stephanie, Lauren, and Kendra--started their blog in 2011 to keep in touch after they moved out of their house and started lives and families on their own. In just a few years, their blog has become one of the top blog sites for women, with millions of visitors each month enjoying the Sisters' family stories, recipes, and tips for running a home. The sisters live in California, Texas, and Utah.